Paul Peel was not yet 20 years old when he completed this self-portrait. He was in the middle of his studies at the Pennsylvania Academy of Fine Art, having already studied under his father (a marble cutter and drawing teacher) and artist William Lees Judson, who later established a stained glass studio in Los Angeles. Unlike Peel’s self portrait of 1890 (also in the Museum London Collection), this painting does not depict a confident professional artist meeting his viewer’s gaze. Instead, it shows a serious young artist engrossed in his canvas. The close-cropping of easel and figure prevent the artist’s surroundings from being seen. 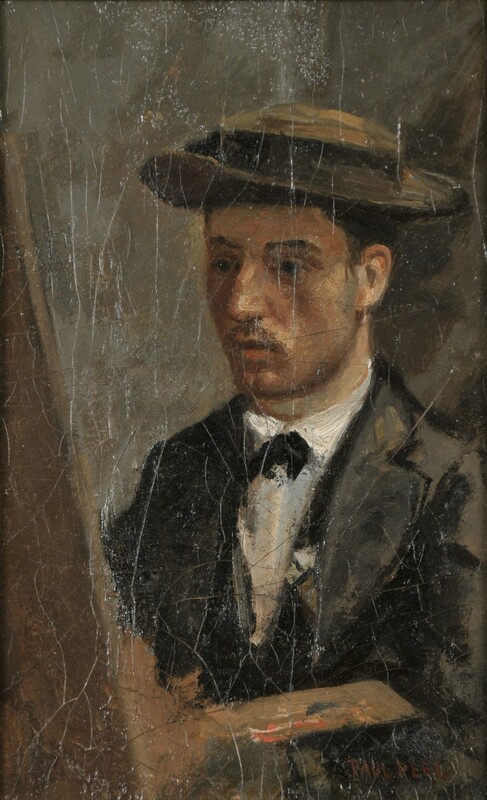 Without apparent decoration and a visible light source, this is hardly the well-appointed studio of Peel’s later self-portrait. Peel was named Assistant Demonstrator of Anatomy at the PennsylvaniaAcademy in 1878. Based on this self-portrait, it seems safe to say that Peel had yet to master the art of fully imbuing the human form with a living spirit and character—lessons clearly learned by the time he completed his later canvases.